The computer will now restart and launch the recovery program. 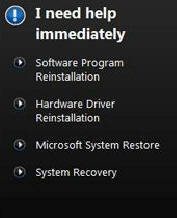 If you are unable to get into Windows to start the recovery then you start the process when you first switch on the PC. As soon as you turn on your PC, tap the F11 key on the keyboard until you get the "Windows is loading files..." message.